Even the most extreme geoengineering approaches will not stop sea levels from rising due to climate change, a study suggests. New research proposes that as many as 150 million people could be affected as ocean levels increases by 30cm to 70cm by the end of this century. This could result in flooding of low-lying coastal areas, including some of the world's largest cities. The team published the study in the journal PNAS. Scientists led by John Moore from Beijing Normal University, China, write that to combat global warming, people need to concentrate on sharply curbing greenhouse gas emissions and not rely too much on proposed geoengineering methods. "Substituting geoengineering for greenhouse emission control would be to burden future generations with enormous risk," said Svetlana Jevrejeva of the UK's National Oceanography Centre in Southampton, a co-author of the study. Geoengineering has been talked about for countering some of the effects of climate change for the past several years, with some figures like the billionaire Bill Gates ploughing millions of dollars into the research. But Dr Jevrejeva told BBC News that some proposals such as placing mirrors in space and spraying aerosols - microscopic particles - into the sky would only treat the symptoms, as greenhouse gases would remain in the Earth's atmosphere. Dr Jevrejeva and her colleagues examined two geoengineering schemes with five different scenarios. The first approach involves limiting incoming solar radiation through the injection of SO2 (sulphur dioxide) aerosols into the stratosphere. Alternatively, giant mirrors could be launched into orbit, they said. The second approach would involve modifying the carbon cycle by either planting more trees (afforestation), converting organic material into charcoal (biochar) or using renewable energy from materials derived from biological sources (bioenergy). "We used [a computer model to track] 300 years of tide gauge measurements to reconstruct how sea level responded historically to changes in the amount of heat reaching the Earth from the Sun, the cooling effects of volcanic eruptions, and past human activities," said Dr Jevrejeva. "We then used this information to simulate sea level under geoengineering schemes over the next 100 years," she added. The team found that, if taken individually, even the most extreme of these methods would result in severe sea-level rise. "We suggested that the most effective approach would be a combination of three different techniques for managing the carbon cycle," said Dr Jevrejeva. She explained that these scenarios relied on biological mechanisms to remove CO2 from the air and store it in biomass, soils or geological storage sites. For instance, afforestation, or adding forests to places where they have been cut down or never existed, would lower the amount of atmospheric CO2, but only by 45ppm (parts-per-million) - a lot less than the amount humans have already emitted. Biochar would reduce the CO2 levels by even less - 35ppm. Biofuel production would be more effective, and the combination of the three methods could eliminate up to 250ppm of CO2 and limit sea level rise to between 20 and 40cm. The carbon storage technique also has other advantages, pointed out Dr Jevrejeva. 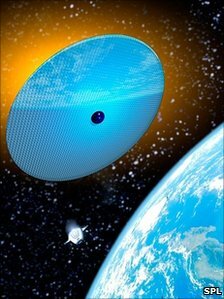 It actually reduces the amount of CO2 in the atmosphere, whereas the method of reflecting sunlight back into space does not. "If you use a mirror, it's extremely expensive and it's an engineering challenge - you have to place mirrors [weighing] some 20 million tonnes into the Earth's orbit," Dr Jevrejeva explained. There was also the chance these mirrors might break in orbit, the researcher added. The same goes for SO2 aerosol injection - a controversial approach that has already been tested on a small scale in Russia by one of the country's leading climatologists Yuri Israel. But Dr Jevrejeva said that even though injecting a certain amount of SO2 into the atmosphere might lower mean global temperatures by 1C or more over a few decades, the CO2 would still persist there. The researchers' simulations showed that spraying the stratosphere with aerosols would produce a similar effect to a major volcanic eruption occuring every 1.5 years. Besides reducing global temperatures, this approach would also delay sea-level rise by 40 to 80 years. "During a natural volcanic eruption, there's usually a cooling effect in the atmosphere and a drop in sea level. We [followed] different scenarios using the amount of aerosols equivalent to the biggest eruption of the 20th Century - the eruption of Mount Pinatubo in 1991," said Dr Jevrejeva. "Particles from volcanic ashes end up in the stratosphere and reflect the radiation from the sun, but the same amount of CO2 stays in the atmosphere, so you do not solve the problem." Also, no one knows the effect such spraying could have on the ecosystem, added the scientist. "It's a huge challenge, no one knows what could happen." In the Proceedings of the National Academy of Sciences (PNAS), the scientists wrote that SO2 injection into the atmosphere would likely lead to such undesirable consequences as "disruption in precipitation patterns and stratospheric ozone, and do nothing to avert the continued absorption of CO2 by the global ocean leading to rising acidity and ecosystem damage." This controversial technique has already been tested in Russia, where scientists led by climatologist Professor Israel sprayed aerosols into the atmosphere from a small aircraft. Professor Israel told BBC News that a stratospheric layer of SO2 could effectively cool the planet and would be an effective and none-too-expensive way of tackling climate change. 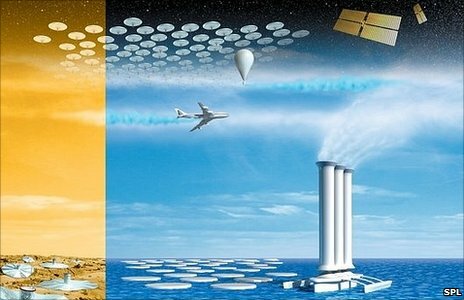 But there are also many opponents of geoengineering techniques, among them former UK chief scientific adviser Sir David King. He told BBC News about his concerns over geoengineering proposals, especially those involving spraying the stratosphere with aerosols. "What worries me is that it's cheap and do-able and all you need is a country with a rocket and they can put aerosols up into the stratosphere. We have no confidence in models on what these aerosols would do there. Sir David explained: "Imagine if the aerosols would in some way cause more aerosol production - because there are a lot of chemicals there including ozone - and in time we find that we're getting more than we anticipated so the planet gets cooler and cooler when we wanted it to be stable"